Saalfeld, prelude to Jena 10th October 1806. Image taken from the front cover. Saalfeld is a ‘mini folio’ game from Decision Games, using a 17" x 11" map and just 40 counters. It uses the cut down (quick play) version of the full system that is presented in the larger game folios. Click ‘read all’ below for a full After Action Report and game observations. 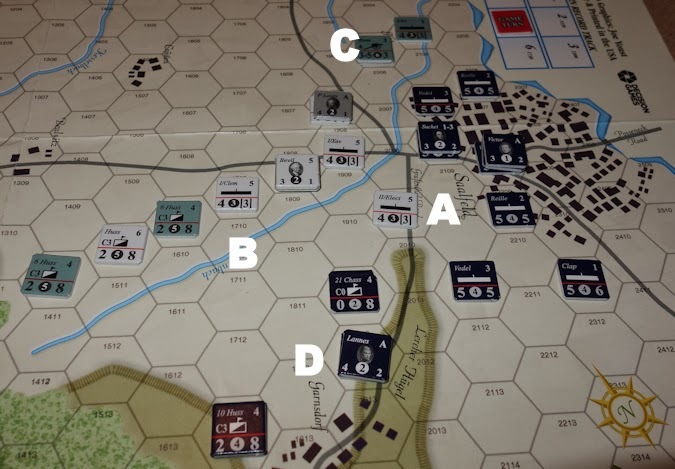 If you would like to have a detailed look at the mechanics of this system using these rules then please have a look at my Shiloh post (link at the foot of this post), which also includes the system errata, which unfortunately has not made it into Saalfeld, though the latest rules can be downloaded. The game comes with the map folded down into 4 panels, giving an A5 sized package, so letter box delivery is fine. Front cover (this is a ziplick game). 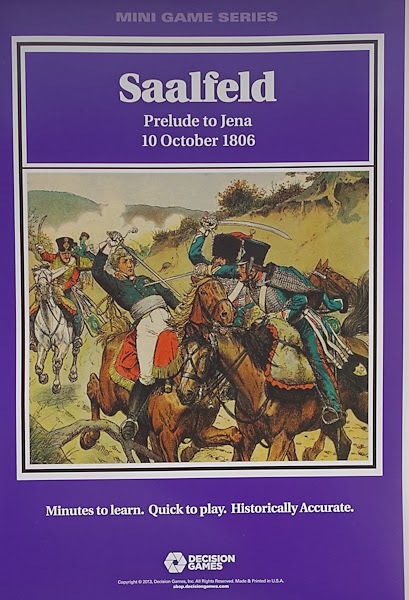 I was not familiar with the battle before getting the game, though I now realise that I have a short chapter on it in my excellent Jena Auerstadt - The Triumph of the Eagle, a most colourful book from Histoire & Collections. 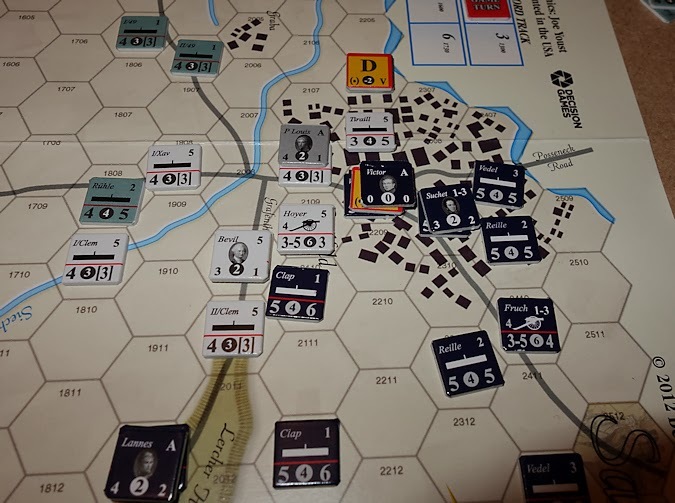 The scenario revolves around a mixed division of Prussians and Saxons located around Saalfeld, an Allied forward position that guarded the roads to Rudolstadt and Posseneck. Lead French elements under the command of Lannes arrived and began their assaults at around 1300 hours. A, B and C are exit roads that give a major victory if all are held by one player. Failing that, a minor victory is based on game casualties. D/ Here are the French cavalry with Lannes. They offer good flexibility to the French player because they are situated to be able to move quickly to support any one of the several options open to the French player at the start of play. E/ The Allies have to set up the bulk of their forces along this line of defence. Note - the substantial number of French reinforcements due on turn 2 (sitting on the turn track). The French decide to advance their infantry on Saalfeld and move Lannes to the right to support the infantry. 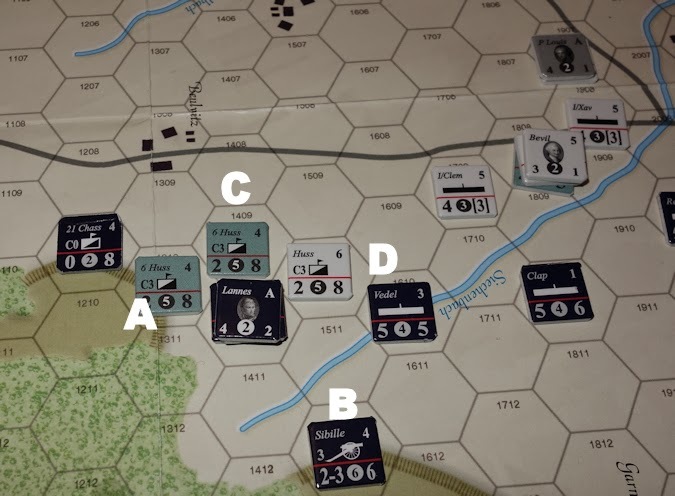 The Allies move some of their cavalry and a couple of infantry battalions out of the line to move towards the exit roads (A and B above), preparing to defend them against likely French attack, as they expect French reinforcements to arrive over on the left side of the map. A/ The French Reinforcements arrive. They can come on at several places along the bottom of the map, which gives them strong forces to attack the other two exit roads. However, they decide to come on at the road just below Saalfeld. 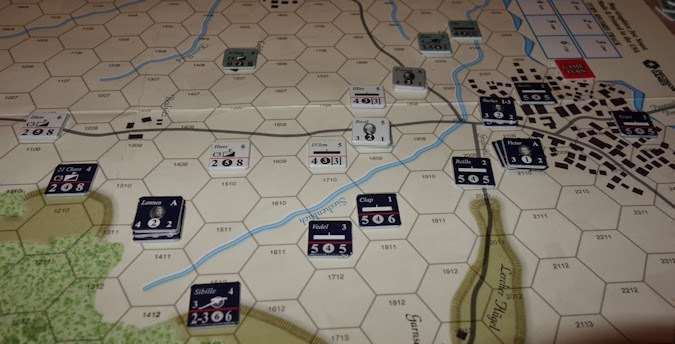 This allows them to immediately tcapture the exit road in Saalfeld itself, but it makes it unlikely the French will now be able to take the other exit roads in time and so this battle will become one of casualties for a minor victory. The Allies are surprised by the move. B/ The French Cavalry keep the flank secure. C/ The Prussians have been caught by surprise and these units are both overwhelmed and trapped - they do not have good futures. In the main, units are regiments or battalions. Most of the Allied units start the game at 1 step strength (the red line across the counter), so this force is quite brittle and needs to be handled with thought. The French have some 1 step units, but they also have enough robust two steppers to be able to confidently take the fight to the enemy. 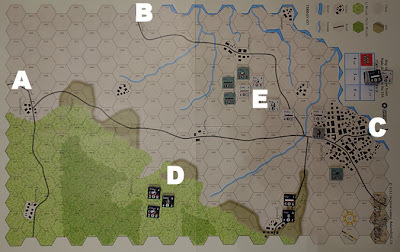 Over these two turns, the Allies are squeezed out of the town and pushed back across the Siechenbach stream. They lose 5 units to the French 1. The Allies in their next game really need to think about getting more units into Saalfeld earlier, as retaking towns is precarious for 1 stepper units. The situation has turned into something of a stand-off. The French are winning on casualty points. They could attempt a major victory by breaking out towards the other two exit roads with their cavalry. A/ The lone Saxon 2nd Battalion (Elector Regiment) is assaulted and removed from play. B/ The stream is a substantial barrier, units attack into or from it at half strength, so neither side are in a hurry to do that. 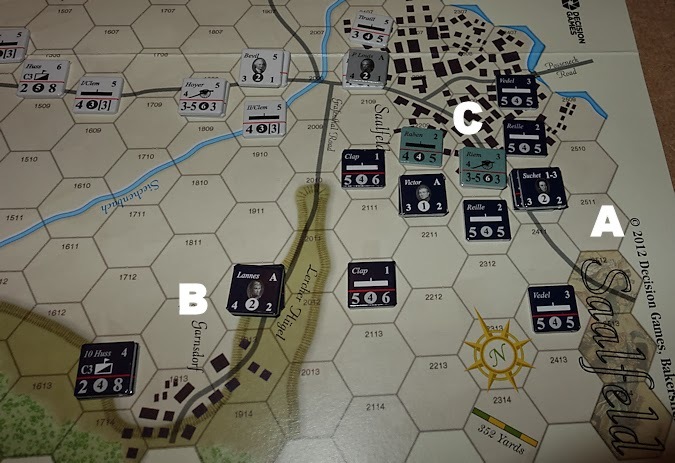 C/ The French consider pushing here, but they don’t have the strength to immediate hand to take any advantage of a break through without leaving the exit hex in Saalfeld vulnerable. The Allied artillery here antagonise the French line. D/ Lannes, with his French cavalry and artillery support decide to put the cat amongst the pigeons and try to break through on the Allied right, with a view to capturing the other two exit roads. They engage the Allied cavalry and throw in some artillery support. 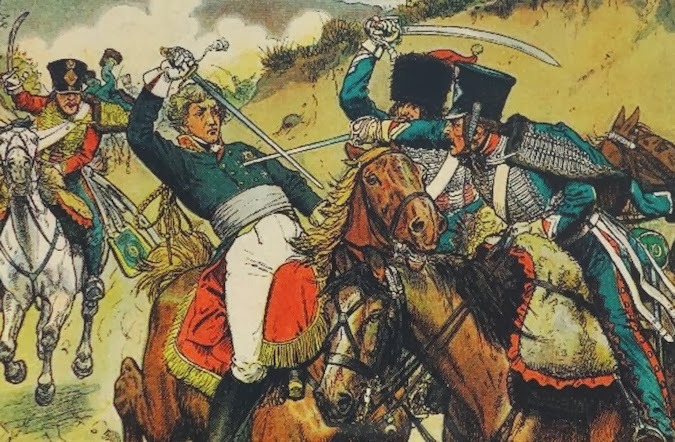 A - In their part of turn 5, the Allied cavalry managed to put up an effective block against the French cavalry assault and so within the time-frame of this game, the chance of a major French victory has been negated. Note - the photo wrongly shows the top left French unit on its ineffective side - it was effective at this point. Units that exert a ZOC onto an enemy do not have to be attacked, but if they are not, at the end of the combat phase those enemy units are allowed an immediate, free counter-attack at double their strength, so it is often best to try and ensure that all such enemy are attacked. A/ is targeted by the two adjacent French stacks (including Lannes), the retreat eliminates the Prussian cavalry. D/ The French infantry attack the Saxon hussars, but they are halved as they attack from a stream hex. The result is Attacker Retreat, so the French fall back. 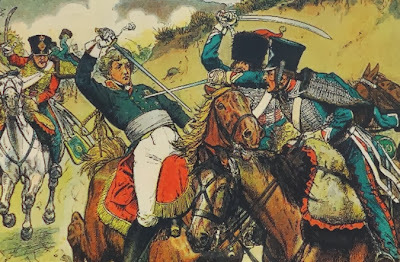 This is not necessarily a bad result for the French as the purpose of the attack was purely to make sure that the Hussars were attacked, to prevent them from attacking Lannes at double strength. 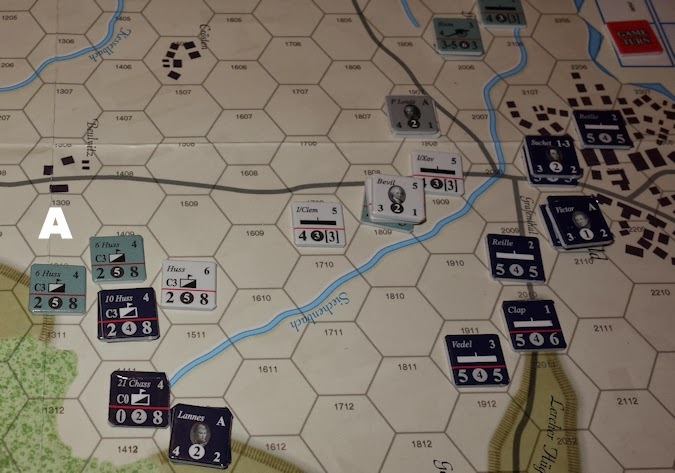 While not a decisive action, it has seen the French get across the Siechenbach stream and if a turn 7 existed, the Allies main concern would be in preventing a French breakthrough to the other two exit roads. The speed at which the French took Saalfeld was a surprise and on a re-playing, I would put more Allied forces into Saalfeld itself, as the French casualties would surely be greater if they had to fight their way into this town. This would probably result in some swirling cavalry battles over the remainder of the map as those mobile forces fight for control of the other two exit points. Conclusions. Overall, I am impressed by this 40 counter game. It is a compact, short game that has several opening possibilities and in that regard it is a puzzle that will entertain for several plays. It is over 3 months since I last had a title in the series on the table (Marengo) and so I needed to re-familiarise myself with the rules and this is a handy title for doing that and getting back into the system. The cut down version of the rules have done a good job in their ‘slim down’ form, but there are still some times when brevity leaves you wanting to look at the larger rules, just for the extra depth of explanation and on one occasion (mentioned above), I used the full rules to cover a gap that I needed an answer to. You can download the full rules from the Decision Games site. The compact nature of the game means that it can be set-up anywhere, so for those with lack of space or looking for a vacation type game, it is a useful product. For a player with mobility difficulties, the game is small enough to fit onto a large tray or board that could even go across the arms of a chair, or can be played on a table edge without having to stretch across the table. At £10.50 (in the UK), the game is good value, simply because it is so accessible and will get played. If you have not been doing much gaming lately and feel you spend too much time at the computer screen, then this game will help you get some game time back. Solitaire - It is a two player game that works fine for solitaire play. The only thing you lose is the optional rule that has the French reinforcement entry point being secretly written down before any units setup. Of course that could equally be made subject of a die roll after set-up, which can enhance solitaire play. Complexity - The back of the pack rates the game as 1 out of 5 (very low). Once you know the rules this is true, but there is quite a bit going on here that is handled differently to many games, so treat game one as a learning exercise. I forgot for example in my first game to use the special scenario rule for skirmish attacks and throughout my first play, I was frequently dipping into the rules while I re-familiarised myself with the system. Size - Well the clue is in the name ‘mini folio’. All you are using are the 17" x 11" map and the rules and a low counter density, so this is a highly portable, play anywhere type game. Storage is around a third of the size of a standard paperback book (thickness wise). the counters are 1/2 inch but the hexes are larger than the standard small size, so handling the units as the lines close is not a problem. Time - The back of the package says 1 - 2 hours. I would say the lower end of that band is about right. Certainly in two player games, this could be switched around to play twice in an evening session. Click on the below link for a closer look at the system and the errata that has some important changes (particularly on rout), the post covers the Shiloh folio game. Click here for the latest rules files from decision Games. 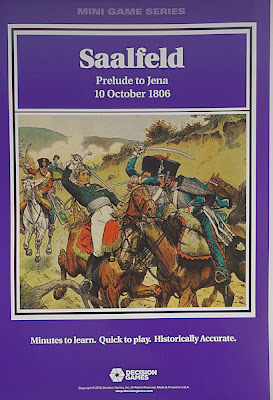 I think it probably the best way to dip your toe into the Napoleonic / ACW folio series to test whether you like it or not. I have tried a couple of their Sabre and Musket series Folio games and they are good. I also like them for their smaller maps, as the largest maps I can play on (due to lack of space) are the 34x22" (approx) standard size. I play wargames so I can study the whole battle, see where alternative decisions could have been made within the framework of the historical setup, and around the game mechanics. 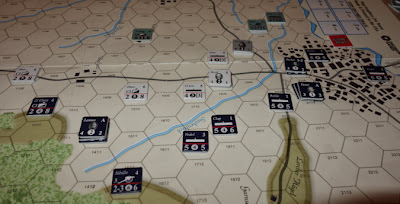 The Marengo game I have just played, I had read the designers notes, and his aim with the game was to demonstrate the importance and difference of command and control between the old style Austrian army command and the new Napoleon type of command, and it was clear to see the difference.